The modern version of the tried and true GE Standard bulbs. Made beyond the ban date. 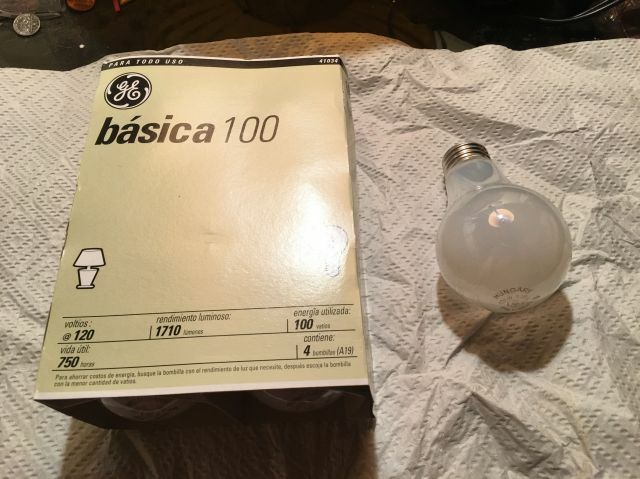 I very much like the old GE Basic/Standard fake frost bulbs, along with the Ace hardware brand versions of same. I have some of each and would like to find more if you just so happen to ever get a line on any. Will send you the eBay link in a bit. No lamp is illegal, they are UNdocumented. For some reason, when I saw "illegal" in the title, it made me giggle a bit. The way the title was written makes it seem like these are illegal in the same sense as weed and stuff like that. They basically are, see the etch on Philips tubes from the 90s..
Definitely a Spanish speaking country. Very cool! I've always wanted to see one of these Hungarian GE Basic bulbs. Looks like a bigger GE meatball logo than the Mexican GE's. Cool find with the Spanish packaging, too! A great 100 watt lamp. I have 2 cases of these in the clear version.